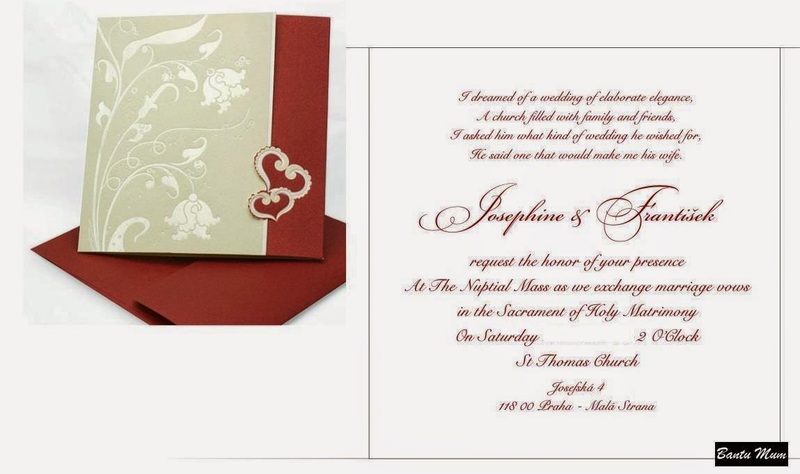 How important is it to you the way your invitation cards look? One can spend a lot or a lot less on invitation cards. Some people might go really simple seeing as cards are just a piece of stationary that'll be discarded after the wedding, while others might prefer to convey the elegance of the wedding right from the start. Whatever your preference is, there'll be cards made for just that. DIY card projects are an option, if you've got the time. I found all the editing, printing, cutting and glueing quite time consuming and that was just name place cards. I found my card provider online, paid her a visit, looked through 1000s of card samples and made 5 choices. I took these to my husband and we made the final pick together. We went for simple and elegant. I also provided wording for the card. This was also a DIY project and I talk about where to get church programs in ceremony venue. Having a reception program helps in letting the MC know what the wedding agenda will be. More so, if you do not have one specific MC. I found though, that once the key speeches are done, the reception program gets ignored. Tip: Account for travel time for both the wedding party and guests when making a program. Here is one I made Exhaustive Wedding Planning Spreadsheet. These were a DIY project. I talk about reasons why I decided on them in How To Decorate Your Reception Venue. Interesting collection of wedding invitations! !